South Korea's airports and expressways are experiencing extreme congestion Saturday, as many people take advantage of extended holidays from late April to early May to visit popular tourist destinations at home and abroad. Incheon International Airport, the gateway to Seoul, said that approximately 174,000 departure and arrival passengers, including 89,300 bound for foreign countries, are expected to use the airport on Saturday alone. The Korea Expressway Corp. said that major expressways leading from Seoul to provincial cities popular with holidaymakers were getting increasingly crowded. Many South Koreans, who have vacation days on May 2 and 4, will be able to enjoy a nine-day holiday, including both weekends, until the end of May's first week. Many local workers stay home for May 1, Labor Day, while Buddha's Birthday and Children's Day, both national holidays, fall on May 3 and 5. For some, the vacation can be extended to May 9, a temporary holiday designated for the presidential election, if they get time off on May 8. Officials at Incheon's airport forecast that the number of airport visitors is expected to reach about 94,000 on Wednesday and peak at 174,931 on Sunday. 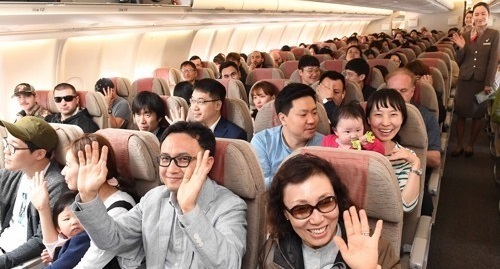 On Jeju Island, the nation's most popular tourist destination, about 500 flights are expected to transport 90,000 passengers to and from the island's main airport on a daily average for nine days until Sunday, officials said. Officials at the Korea Expressway Corp. said the number of vehicles on the nation's expressways is expected to surge to 4.87 million on Saturday, up about 100,000 from the previous week.